Another colleague of Alan Wilson and Baram Blackett is Mr Alan Hassell of London. This tireless researcher is the metal detection expert who has assisted Alan and Baram for may years. The ability to detect larger metal objects up to thirty feet below ground and to differentiate between ferrous and non-ferrous metal when detected was of great value to the research programme. Alan Hassell took a keen interest in ancient British London, the "Troy novantium" as King Edward I knew of it. He knew of the Brutus Stone that is the ancient foundation stone of London. 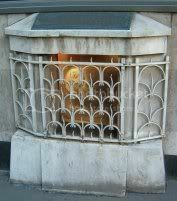 Adrian Gilbert traced this in 1996 to the resting place of the last remnant of the stone that is in an alcove cut into that wall of a London bank. This Brutus Stone was there from time immemorial until the London Authorities cut away two thirds of it to make way for a road-widening scheme. Jack Cade who is almost certainly Sion O'Ceint �John of Kent in Khumric records, and the leader of the peasants revolt in AD 1381 took an oath and confirmed his oath by striking the stone with his sword. One of Alan Hassells projects was to take a close look at the Sutton Hoo Treasures in the British Museum. In common with the persistent policy of archaeologists having only two labels-one Roman and the other Anglo-Saxon-the Museum hs come up with the totally unsubstantiated story that the boat burial at Sutton Hoo was probably that of an Angle King named as Redwald. The reasoning behind this assertion is flimsy to say the least, and without one single iota of proof only assumption. The largest grave mound at Sutton Hoo was excavated in 1939 in the summer just before World War II broke out. The archaeologists did a very good job indeed and they were able to completely expose the entire shape of a large boat that had been buried in the mound although not a scrap of timber remained. They exposed evidence of the ancient planking, and of row upon row of large iron rivets had been used to secure the wooden planking together, rows of rivets that lay in gently curing rows outwards from the vanished keel, and upwards from the vanished stern and from the upward curling bow of the vanished ship. This remarkable find immediately raised the question of who had owned this ship in the mind of Alan Hassell. It was known from the time of Julius Caesar that the British, and their kinsmen in what are now the Breton and Normandy areas of France, used large iron bolts to secure the planks of their ocean going ships. The British had access to the largest iron ore deposits in Western Europe, in South East Wales in Glamorgan, before the Swedish irom ore resources were tapped in relatively modern times. Yet the Angles and Saxons used wooden dowels in their ships. This immediately raises the question of whether this ship that was buried in a grave mound was British or immigrant German Angle or Saxon. 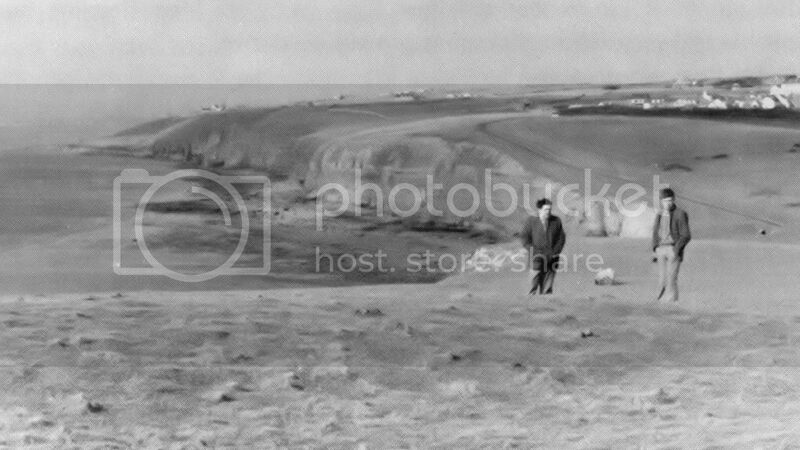 As Alan Hassell points out the grave of King Ceri Longsword, who fought the Romans successfully from AD 52 to AD 74, is at the boat shaped mound at Nash Point as recorded in the Songs of the Graves. 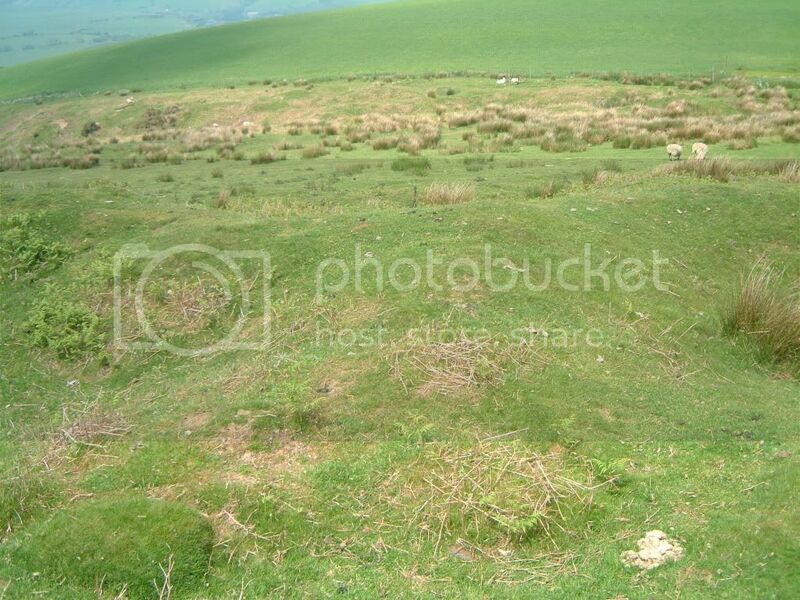 The boat shaped grave of King Meurig (My-Rig) the father of King Arthur II is inside a huge boat shaped mound and ditch enclosure on Mynydd y Gaer �Fortress Mountain. This grave mound is around 120 feet (37 meters) long and thirty feet (9 meters) wide. The Songs of the Graves identifies the site of the grave of Bedwyr ap Pedrog (Sir Bedievre) is also clearly boat shaped, and so on. This fact and other traceable evidence of recorded and known British boat shaped burials, raised questions in Alan Hassell�s mind. He then noticed the remarkable reconstructed purse that was found in the Sutton Hoo ship burial. The leather had rotted away but the jewelled and ornamented parts of this purse remained intact and so restoration was possible. The immediate and plainly obvious fact was that there were representations that appeared to be of the widely known Gilgamesh figure clearly exhibited on this ancient purse. The Gilgamesh epic of the exploits of King Gilgamesh of the ancient city of Uruk,is the major epic story of ancient Mesopotamia and Syria and Asia Minor. This was not a story known to the Angles or the Saxons. There is however a Nordic ancient tale of being attacked by two gigantic wolves. The animals that are shown attacking the human figures made up of jewels on the side of the purse do in fact appear to have manes. The animal that has a mane is a lion, and therefore it is quite a possibility that these jewelled animals are depicting lions. The tails of these animals are also important as they are shown as long and curling. This would probably introduce the Bible story of Daniel being thrown into the lion�s den in Babylon. If this is the case then the attribution of the manufacture of this purse by a craftsman, and also the owner�s nationality as a Germanic Angle king is called into question. The human figure is not shown grasping the animals by the throat as is usually the case in the standard Gilgamesh representations. This again pointed to the fact that the Sutton Hoo ship burial as ancient British and not later German Angle or Saxon. The typical Gilgamesh representation is of a royal male figure standing with his arms outstretched and holding either a pair of lions, or bulls, or even rams, by their necks. The figure shown on the Suttoo Hoo purse is unmistakeably one that is involved with lions and that introduces the story of Daniel in the Lions Den, or that of the legendary founding King Gilgamesh. Equally important there is a very clear Christian Cross incised on the handle of each spoon immediately below the bowl, and before the lettering. Once again the known fact is that the Angles and Saxons were illiterates and it was not until King Alfred, the poor baker, sent messages to Wales, Scotland, and Ireland, for Geraint y Fardd Glas, for John Scottius, and for John Iregena, to introduce writing into his kingdom that literacy arrived in Anglo-Saxondom. Geraint was known in England as Asser, and he with John Scottius, and John Erigena, are the legendary founders of Oxford University. As the golden spoons from Sutton Hoo clearly had a form of the Khumric Coelbren Alphabet cut into the handles it was already almost a impossibility for this ship burial to have been either Angle or Saxon pagan burial. Alan Hassell who is an expert photographer then looked at another major Sutton Hoo relic. There is a remarkable ornamented golden bowl that was found in the Sutton Hoo ship burial. This bowl is very clearly decorated with ornamentation that shows what can best be described as a number of Maltese style Christian Crosses. These would indicate that it was a Christian person who was being buried, and this immediately raises the question of the race and nationality of that person. 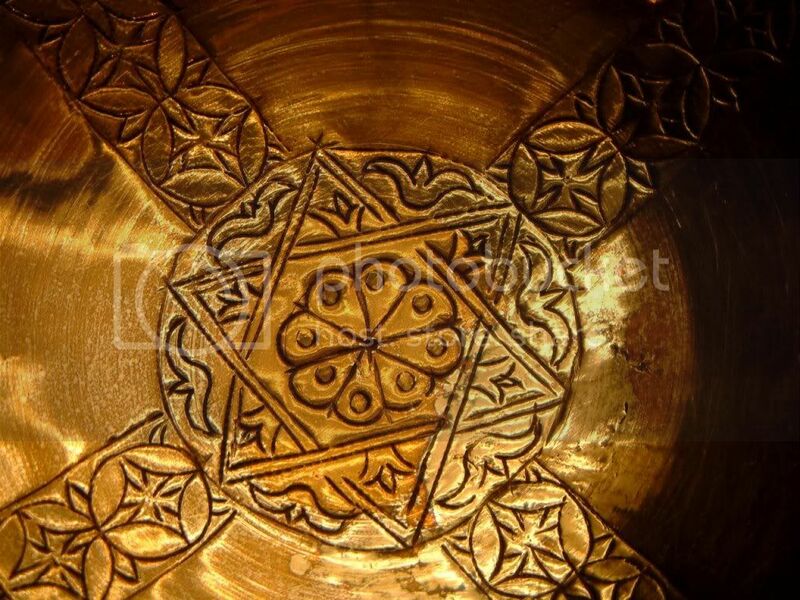 There is however something that is even more remarkable as there is incised on the centre of the Sutton Hoo golden bowl, as plain for everyone to see there is the symbol known as the Star of David. < href="http://s777.photobucket.com/albums/yy54/treasureone/thunting/?action=view¤t=stardavidBM.jpg" target="_blank"> This six-pointed star symbol appears on the flag of modern Israel. In the centre of this Star of David symbol is an eight petalled flower and this is a royal symbol found in many ancient Egyptian scenes. Set around inside the six points of the Star are six representations of Lilies and the Lily was an ancient royal emblem that was later used by the Frank-French Kings. Another symbol that appears outside and immediately between the outer points of the Star are six Doves, and again Doves are important symbols of Hebrew �Judean lore, and Doves were a bird that were a frequent sacrifice made to Israel�s God Jehovah. To round matters off at this stage the remains of a distinctive shaped �lyre� were found in the Sutton Hoo boat, and these pieces were successfully reconstructed to show how this musical instrument might have appeared. It seems that Khumric Wales is once again being located on the dark side of the moon as far as the British Museum is concerned. This Sutton Hoo �lyre� just happens to be the same shape as the ancient Khumric �crwyth� a guitar like musical instrument that was in use until fairly modern times. It is no co-incidence that when white settlers first began moving into the mid west some 250 years ago they encountered a strange race of White people who were called the Mellungians. The late Jim Michael of Louisville took great interest in researches into these white Mellungian people remain an unsolved American mystery. The best theory that he and Alan Wilson came up with was that they were partly descended from the ancient Khumric migration into this area of North America, and that they might have been the people who contacted the survivors of the disastrous first English colony in North America, and possibly removed them into the interior in Kentucky and Tennessee. The point here is that the Mellungians still make the same identical musical instrument as the ancient and recent Khumry made and used as their Crwyth. 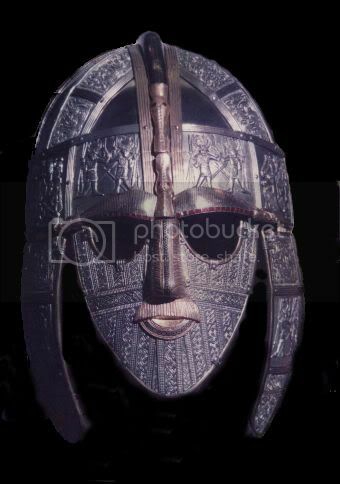 The dates of the lyres are Sutton Hoo around AD 630, the Khumry �Welsh� from time immemorial to around AD 1800, and the Mellungians up to our present times. Exactly the same musical instrument, and one wonders if old King David and Solomon used the same musical instrument. Just what a very clear six-pointed Star of David symbol doing set prominently in the very centre of the elaborate ornamentation of the golden bowl in the Sutton Hoo ship is a matter of huge interest. This design is harder to miss than it is to see. It the presence of this design that is peculiar to the Kings of Israel, is taken into account with all the other alleged �Anglo-Saxon� relics, records, and remains, then there is a substantial case to be made for a King who was descended from the tribe of Judah whose ancestors arrived in Britain around 504 �500 BC being the person whose monument this Sutton Hoo mound was. All the evidence points in this direction and it give substantial credence to the ages long belief that ancient Davidic Kings were in ancient Britain. Perhaps it should be clearly stated that neither Alan Hassell, nor Alan Wilson, nor Baram Blackett, has any strong religious beliefs, and none of them are members of any religious organization or society. In fact all of them would have had a quiet laugh if this situation had been proposed to them before they began their investigations. There are however very serious people in Britain and Canada, and probably elsewhere, who firmly believe in a Davidic Link with ancient royalty in Britain. There is also a magnificent metal helmet that was found in the great boat-burial at Sutton Hoo, and even that artefact is surprising. The Helmet has metal flaps that could be closed to cover the wearers face below the eyes, and the design shows a male person�s face with a moustache, but otherwise clean-shaven. 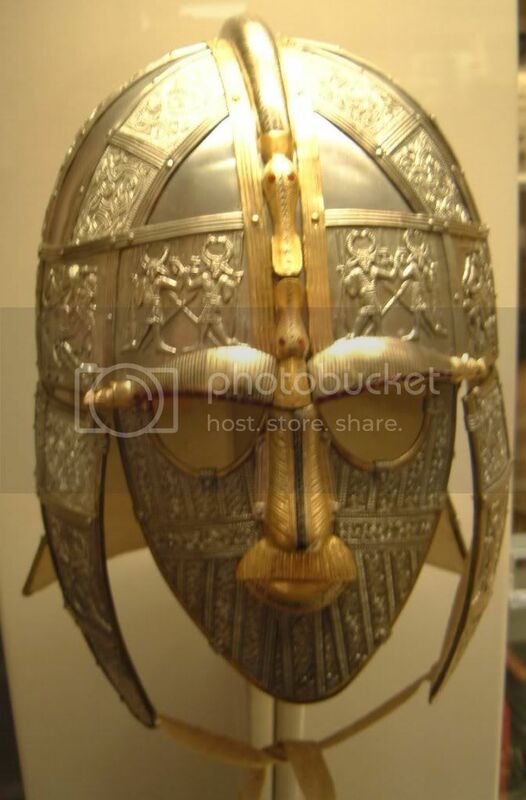 The British were known to be clean-shaven apart from wearing moustaches, and the Angles and Saxons were bearded, and this helmet is major cultural evidence of an incontrovertible nature. The signs are that the owner and wearer of the helmet was indisputably British and not Germanic. The burial was that of a British King and we have his portrait to prove it. You only see things if you look for them and Alan Hassell very definitely looked at the Sutton Hoo treasures in the British Museum as well as many other things from ancient Eastern Britain. Once we again recognize our ancestral records then we can restore at least part of our ancient History. The archaeologists recognize two ancient cultural explosions of advanced skilled metal working people coming into Britain around 1600 and around 500 BC. The advent of these traceable metal-working cultures into Britain matches with the Historical records of the invasions of Albyne around 1560 BC and of Brutus around 500 BC. Yet the Historical Establishment blindly ignores all this archaeological evidence as if it did not exist. < href="http://s777.photobucket.com/albums/yy54/treasureone/thunting/?action=view¤t=stardavidBM.jpg" target="_blank"> This Star of David symbol may be of huge significance as there is definitely evidence that when the Assyrians deported huge numbers of Ten Tribe Israel known as the Khumry between 740 � 702 BC, they also deported numbers of the tribes of Judah and Benjamin. As the Khumry �Israel Ten Tribes are definitely provably the Khumry known as the Welsh - �walische� -from Old High German, it is logical that member of the Two Tribes of Judea also accompanied them into Britain. Khumric people lived mainly in the West of Britain, but there were Khumric Kings right through the Midlands of what is now England in Warwickshire and Leicestershire. One Khumric King of Leicestershire is recorded in the Brutus of England around AD 720. So we have a Khumric or Davidic link with symbols plain for all to see on the Sutton Hoo golden bowl. We have straight stroke ancient British Coelbren writing incised on two gold spoons. We have a ship made with iron bolts in British fashion, and not in Anglo-Saxon fashion. 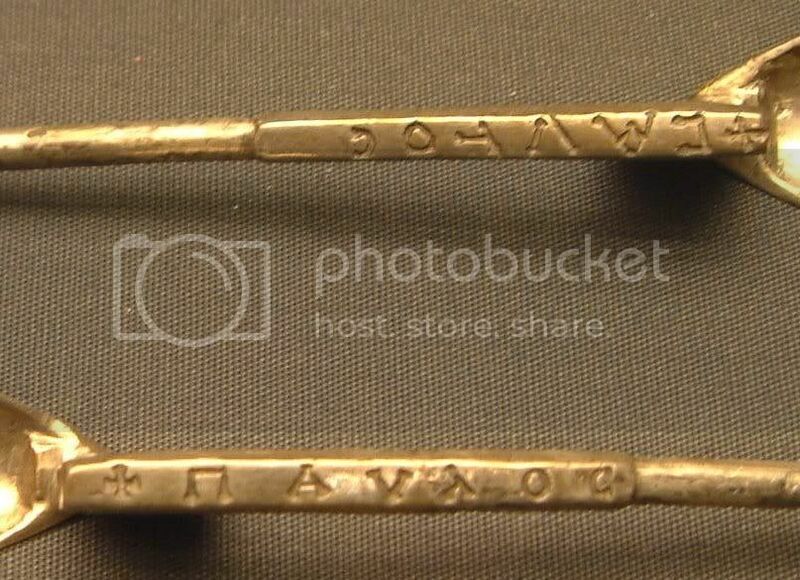 An attempt to try to read the short inscriptions on the handles of the two gold spoons found at Sutton Hoo was made by Alan Wilson and Baram Blackett. They did this because there is no apparent effort at decipherment into what is called �Anglo-Saxon�. The short inscriptions appear to from read left to right starting from the spoon bowls and preceeded by the Christian Cross. One spoon appears to have either + CAU LLOC or CAW LLOC incised on the handle. CAU means enclosed, and this could be in the sense of being �enclosed� in a protective manner. Then: - CAW means �a graduated bard�. Then: - LLOC basically means �a pen� or a �fold� (as in "a sheepfold") There are then several LLOC + words, and we have 1.�Lloches� meaning �shelter� or �refuge�. Next there is: - 2.�Lochesu� meaning �to cherish� or �to shelter�. Then there is: - 3. �Llochiad� meaning �protect�. The inscription on the second spoon appears to be either + NAU LOC or NAW LOC incised on the handle and once again the fouth letter is difficult. There is a possibility that it is a "D". Otherwise it suggests an "L", or less likely a "LL". So we may have NAW or otherwise NAWDD. NAW means �kin�. Then: - �NAWDD� means "patronage" or "protection" or "support". Then: -OC means �from�, or �of�, or �out of�. If these brief phrases can be construed as associated with a qualified person who is able to offer Shelter or Protection, or is to be a person offered some form of Christian Shelter or Protection, then it is quite possible that the golden spoons are part of the equipment required in some form of anointing ritual. The presence of a clear ChristianCross symbol on each spoon that preceeds the short inscription certainly points towards the spoons being used in Christian ceremonial occasions. 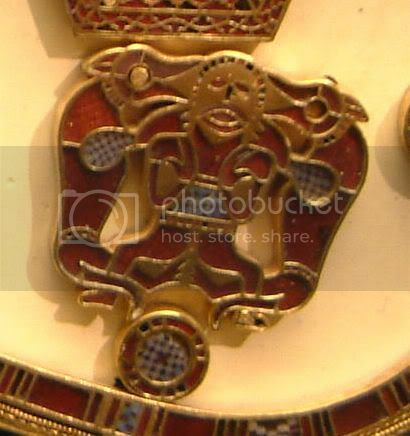 There are then two other strange designs on the Sutton Hoo purse made of gold and jewel stones. These designs show a large bird of prey attacking a duck, and anyone who has read the Khumric �Mabinogi� solar and stellar stories will immediately recognize this scene as from the Mabinogi of Peredur -Steel Shirt, where Peredur sees a bird of prey kill a similar Duck and causes the red blood to flow and to mark the white snow on the ground. So just why is this British motif portrayed on the magnificent Sutton Hoo purse, if the Sutton Hoo burial allegedly was not British? Well done Mr Hassell. Another matter that needed consideration was the existence of a corpus of ancient writings that had again been casually labelled as Anglo-Saxon despite the fact that these primitive tribes that had entered devastated depopulated Britain in chaos after the catastrophe of the impacts of debris from the passing comet of AD 562, were illiterates. Several of these surviving documents carry the name of the author (or copyist) and he was named as Caedmon, and Caedmon is a distinctly British name and definitely not an Angle or Saxon name. Add to this the Khumric Welsh historical note that the language that finally prevailed in Lloegres, or Moon Country or England, was that of the Icinglas. It means that the Language that prevailed and eventually became English was the language of the Iceni Nation of Eastern England. 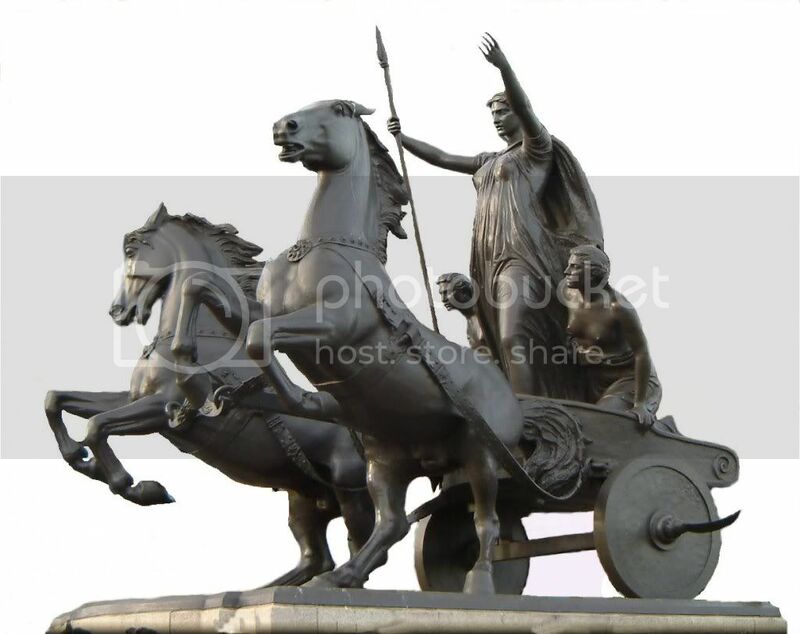 The Iceni are probably best known through their Queen Boudicca �Boddicea, who led a major campaign against the Romans. Her final conflict with the Romans took place at Gop Paulini or Paulinus� Gap in North East Wales where it appears that the Romans stood in a natural geographic gap position to avoid being outflanked by the superior numbers of the British Iceni nation. The largest battlefield grave mound in Britain marks the site, and a standing stone on a nearby hill is associated with the Queen Boudicca. If the language of the Iceni prevailed as the foundation or cornerstone of English, and the Iceni are descendants of the Albyne invasion of around 1560 BC then English is the oldest Language in Britain. There is further evidence that a mass evacuation out of Britain did occur yet few people have researched the project enough to realise why Gilda�s who was with King Arthur would want to go there because he is buried behind an altar of Rhys Monastery in Brittany as described in Artorious Rex Discovered by Alan Wilson and Baram Blackett on page 176. Gilda�s is not the only person mentioned in the book to have died in Brittany either because it stands to logic that if a person moves to another country for some reason or another and dies there he will be buried there according to Christian custom and tradition. The question is how many of Arthur�s great knights from his mighty army that he took over there are still buried there this needs serious investigation and only adds more evidence that had been previously overlooked by many Arthurian scholars and writers. The same thing happened to Immanuel Velikovsky when he started writing, �Worlds in Collision.� What wasn�t known at the time was that the ancient Welsh Mabinogian was not a collection of stories one would tell to children at bedtime but and encoded book that told of the creation of the World when all the planets were in turmoil with one another. Hmmm who said heraldry started in the middle ages another blot on the English establishment�s lies and fabrications. But that�s not all there�s more evidence that cannot be revealed on here this is just an eye opener to prove that this is not fabricated or invented information. It tells exactly where J.C. was buried too which isn�t good news for the Roman Church especially when its credibility is under attack because of abuses made by priests and bishops against children in their care.